Happy Fall everyone! I was fortunate enough to spend last weekend in the mountains and it was fabulous. I was at the Women’s Retreat with my church and it was wonderful to spend time with other women of faith, and learning more about God. You can truly see the beauty of God’s creation in the mountains during the fall! I am back with the final part in my Fall Trends series and today I am talking about velvet. If you missed Parts 1 or 2 of this series, you can read Part 1 here and click here to read Part 2 of my series to learn about some of my other favorite trends for fall. Now I have to say, if someone told me even a year ago that velvet would be a top trend, I am not sure I would have believed it. Previously, when I thought of velvet, I had this vision of a 60s leisure suit…something that Austin Powers would wear! But, that is not the case any more! Velvet is so on trend right now and there are so many ways you can incorporate it into your closet. One of the easiest ways is to add velvet to your wardrobe is to add a velvet purse to your collection. We can never have too many purses, am I right?!? I found this super cute velvet clutch that I fell in love with. First, I love the color (gimme all the pink!!) and the clutch is a perfect size for a night out. This one also comes in a few other great color options for fall. 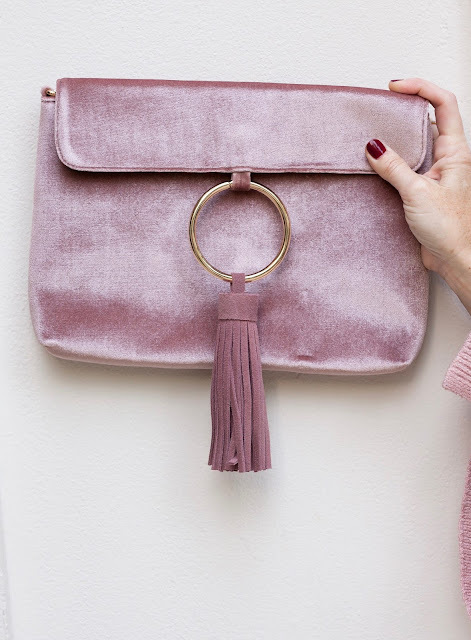 And I think velvet is a bit dressier than most other purse materials, so you could easily use a velvet purse for a fancier event or night out. Another top velvet trend right now is shoes. These pretty burgundy velvet booties are so unique and a great way to add some velvet to a simple outfit. Here I paired them with a simple white tunic and jeans to draw attention to my cute shoes. You can also find velvet sneakers, flats and heels right now, and many are super affordable! I’ve linked 2 pairs of velvet shoes under $25 here and here. And finally, there are so many fun velvet tops out right now. You can find velvet tops and jackets in every style and price point! For a more subtle look, I like adding a velvet cami under a black blazer and jeans, and the cami I have on here is only $13! This is a great look for a night out with just a touch of velvet. I have also linked some other cute velvet tops under $25 here and here. I hope you have enjoyed this series and have been inspired to try out some of these fall trends. Are there any other topics you would like me to write about in upcoming blog posts? If so, please add a comment on this post or send me an email at smartsoutherstyle@gmail.com. I would love to hear from you! Thanks so much for reading. I truly appreciate it! Love the bell sleeves and these colors. The cami is a great way to add a little velvet. Do you order from Target or find these items in the store? Guess my Target store is smaller but I'm not finding any of these trending items in the store. Thank you! I find some of my items in Target stores, but some I order on line. They have free shipping & anything that doesn't fit I can return to the Target store. They have lots of cute stuff right now! Thanks for commenting and reading the blog!